This review is written with a GPL 3.0 license and the rights contained therein shall supersede all TOS by any and all websites in regards to copying and sharing without proper authorization and permissions. Crossposted at Bookstooge.booklikes.blogspot. wordpress.leafmarks.com & Bookstooge's Reviews on the Road Facebook Group by Bookstooge's Exalted Permission. 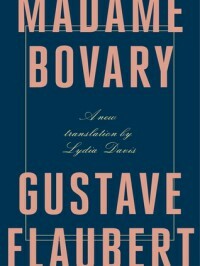 Emma Bovary is married to Dr. Bovary and is the "Madame Bovary" of the title. The story starts out with the Dr though and gives us in a chapter or 3 his history until he marries Emma. Once married, we get the story from Emma. And what a story it is. A story of discontent, selfishness, betrayal, greed, lust and the ultimate end of all of those things. I read this on my phone, so it was read a page at a time, here and there, now and then. I did not read large chunks at a time. I suspect that helped my enjoyment of this immensely. If you had told me that reading about Emma's self-destructive spiral leading to her suicide would be enjoyable, I most likely would have drummed you out of whatever establishment we both were inhabiting at the moment and made sure that you weren't drunk, high or mistaking me for somebody else. But I did enjoy this a lot. Part of it was the writing. Flaubert handled words like a master wordsmith. When somebody is skilled at something, it shows and it makes it easier to watch/read/partake of whatever they are offering. Like I said at first, reading this in tiny chunks just worked out really well. I got a taste of how horrible Emma was, and let me tell you, a shallower, vainer, stupider and down right pleasure seeker was never written but it was never overwhelming or despair inducing because it was read in manageable chunks. Most classics I plow through and this would have been like getting dumped on by a manure tractor. But instead I simply got splashed by a car passing by and then went home and changed clothes. It made all the difference. It also made a difference that Flaubert didn't glorify what Emma was doing. He simply let the results of her actions catch up to her. I'm a big advocate of moral cause and effect and while some of that can be seen on a personal level, more of it is on a macro level and not seen for a generation or two on a national level. So seeing it work out the way it did was actually encouraging instead of discouraging. On a personal level, reading this book has made me even more grateful that I have learned to be content and that I have a wife who loves me and is content as well. It doesn't mean I don't dream or want to improve our lot in life but it means that if I can only afford a 20 year old used car, then so be it. Reading this also reminded me that thoughts lead to actions and have consequences. I think I have said enough. I'm not sure I'd want to read this again because I probably wouldn't enjoy it as much.